I spent yesterday reading a book published by John’s Hopkins University Press: Einstein’s Jewish Science. In one of those lovely and rare moments, something I am working on for my non-fiction/Dittrick-related projects overlapped with a concept I’m working through in fiction. That is: what are the intersections between religion and science, between belief in God and belief in the universe? For Einstein (and forgive the oversimplification), the universe was God. Rather than a supreme rule-giver, he saw the many mysterious filaments of space and time as the outreaching principle of “god”ness. This idea comes, in many ways, from Spinoza–accused of heresy by Jews and Christians alike, Spinoza’s concept of ultimate logic binds the idea of God into creation, creation and God are one and the same. I spent time with Spinoza in my dissertation, so again, this is a generalization of what’s really far more complex. But that is the point really; it’s all far more complicated than we have words to capture. And for Einstein, it was the mystery of that which spurred humanity. We are always on the edge of knowing, the edge of seeing, the edge of something bigger than our minds can fathom. It put me in mind of a blog post written a few years ago, when I got my first dose of quantum entanglement. [REPOST] Last night, I spent an hour watching NOVA’s Fabric of the Cosmos. I then spent several additional hours researching quantum mechanics and “spooky action.” Why? Well, for starters, this is what passes for big fun on a Monday night in the Schillace household. But it is also true that I’ve maintained a fascination for physics since my youth. I was even lucky enough to teach with Dr. Philip Taylor of Case Western Reserve University–and though I was “co-teaching” I think I learned as much as or more than the students. That class concerned energy resources, but I am particularly interested in quantum mechanics, probability, and the extremely improbable (and yet testable) actions of very small things: Quantum Entanglement. Hang in there, though! I promise this foray is very much for the uninitiated novice–since I am one myself. Physics need not be unapproachable; for me, it is a useful lamp enlightening my understanding of self, of reality, and of God: the Big God of very small things. 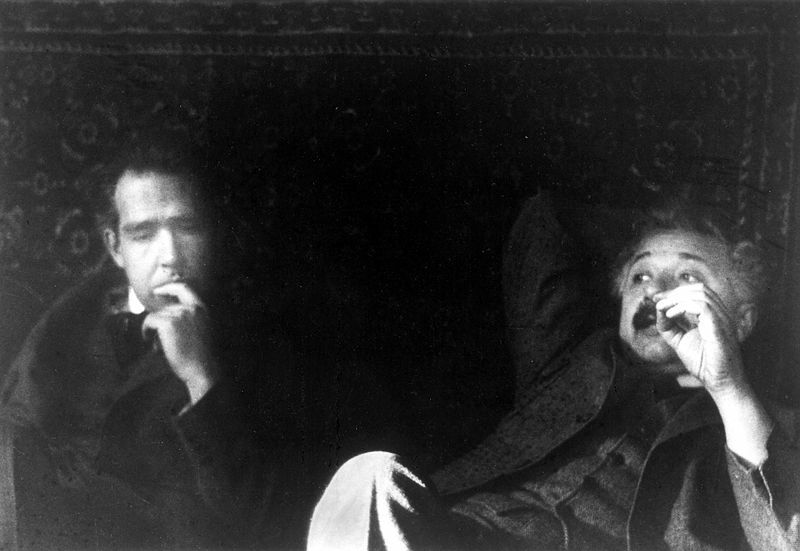 The bizarre nature of Quantum Entanglement spurred a famous debate between Albert Einstein and Niels Bohr. Bohr’s theory–which I am not remotely qualified to explain, though I will try–suggested that: 1) two particles could become interrelated or entangled and 2) after which, they could interact even at astronomical distances, without any visible connection. This alone is not so wild a notion. But there is more. The location and action of very small particles, electrons, let’s say, can only be predicted in terms of probability waves. We can’t fix an electron until we have measured it. We can’t even tell if it is spinning clockwise or counter-clockwise until we have measured it…and here is the mind-blowing part–the act of measuring it determines both its spin and its location. Let me try to break that down a bit better. If I measure Electron A, I have just “forced” it to have a specific location and spin. And, somewhere out there, Electron B (which is entangled with A), has also been “fixed” because of my measuring. What? That makes no sense. That’s what Einstein said, too, and he compared it to playing dice with the Universe: “I’d like to think the moon is still there, even when I’m not looking at it.” Wise words. And yet, again and again, physics has proven that this entanglement–what Einstein attacked as “spooky action”–exists. It’s weird. It’s as though by the mere act of looking, we make reality–we make things exist. To Einstein, that flew in the face of certainty and–in a sense–of a God-ordered universe. But does it? This question leads me to my own fascination with Quantum Mechanics: for me, the flex of all particles, the nature of probability and the fact that we can influence that probability by “fixing” reality enlarges (rather than threatens) my picture of God and my understanding of the world. Should it be so strange to us that “looking” makes reality? Isn’t that true of so many of our experiences? What is “gender” or “race” but a word that we have used to define things which are, in fact, in-determinant, always changing, individually distinct and never truly fixed? I was nearly five years old before discovering that I was “female” and so different from my “male” playmates, with different expectations (and some unfair limitations). The day previous, I was a child, free to do as I liked. The day after, a fixed entity that would either conform or resist–but in either case, conform to or resist against a “thing” that had been suddenly created in my world. As an electron, I had been pinned. This has been part of a sad history in our culture, one of naming so as to exclude–but mightn’t it also be a force for good? For change? Mary Wollstonecraft, Francis Power Cobbe, Josephine Butler, Martin Luther King Jr. and more would say yes. We use words to make reality, and words–like the mathematics described by Bohr–are really systems of measurement. We speak things into being. We talk ourselves into the labels and roles and even feelings that make up who we are at some fixed point. We do not “be”–we “become.” To Einstein, at the quantum level, this looked too much like a universe ruled by chance. However, if we step back–back to the Word, the Logos, the speaking of worlds into being–then it seems much more like a universe wherein we are all, constantly, effecting change through seeing, through entangling, through speaking. Multiple worlds may exist at any one moment, determined on waves of probability and fixed only when we name them. Word is powerful. Word has been creative and destructive. And it is a power left in our finite hands. This does challenge my view of the cosmos and so also of God–but only because my picture of God was too small, too limited. How wonderfully freeing to think there is a realm, somewhere on the other side of the Big Bang, where Life, the Universe and Everything (to quote Douglas Adams) is just on the verge of being born, on the crest of a probability wave of becoming. All things are possible; we are only limited by the parameters of our own system of measurement. Why should we limit ourselves to a godless universe, when infinity itself beckons?